(if you will pardon my language for a moment)! HEAVEN! (even if I did not get any facetime with the man)! So, how many times can one person listen to Blues Clues before going completely insane? :) At least we have several episodes to choose from .. it's not the same one over and over again! Jenna is still sleeping right now, so Sam and I are in my room, watching Blue and playing on the laptop! Busy week ... but fun week! 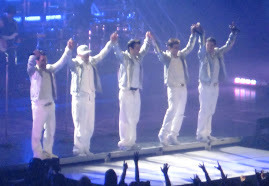 Wednesday - I am going to see New Kids On The Block - OH MY GOODNESS!!! I can't believe it is just 2 days away!!!! WOW!!! YIKES!!!! They are going to be in the same building as me for the first ever!!! I just don't know how I am going to be able to handle it all! By Saturday I am going to be exhausted but I think it will all be worth it!! !